I’m always looking for ways to pack less. Traveling carry-on only is important to me, so anything I can do to reduce the amount and weight of what’s in my backpack is worthwhile. This means that instead of packing something, I may simply buy it there. Plus exploring markets and shops at your destination can be a real cultural experience! Subscribing to this mindset is not always the easiest when heading to new and unknown (to you) destinations, but it’s the one that can make the biggest impact on your packing. Let yourself buy it there, if you actually end up needing it. This is especially important if you’re traveling for a long period of time. The liquids restriction is a major hassle, and you don’t want to be forced to check your bag because your shampoo bottle is bigger than 3.4 ounces/100ml. You probably don’t need as much as you think. 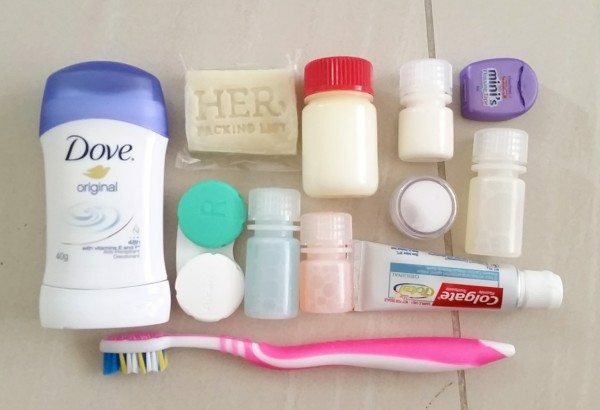 Read about how long toiletries last. Pack enough shampoo and conditioner to get through the first week or two of your trip, and then buy more while you’re traveling. People wash their hair in other parts of the world too, so you’ll find shampoo just about everywhere. It might not be your favorite brand, but it’ll still clean your hair. The same goes for lotion, soap, sunscreen, after-sun lotion, bug spray, and much more. Some things might be a little more expensive in other places, but the cost is usually offset by not having to pay for checked bags. And sometimes you’ll get lucky and pay less than you would at home. Check out the best toiletries for carry-on travel. Buy toiletries on the road. It’s always worth having a few first aid items in your bag, but you don’t need to plan for every possible medical emergency. Pharmacies exist in most parts of the world, and you can get supplies there if you need something, often for a fraction of the price you’d pay at home. If you take prescription medication on a regular basis, talk to your doctor before you leave for a long trip. Common prescriptions can often be filled in other parts of the world as long as you have the prescription written out with the generic name. See our tips for packing medications for travel. If you’re spending a lot of time in warm climates like Southeast Asia and a short amount of time in cold weather like New Zealand in winter, buy a winter jacket and some warmer clothes once you get to the cold destination. Look for secondhand stores or talk to other travelers who might be leaving and don’t need their gear anymore. If most of your trip is spent on the beach, but you’re planning a trek in the mountains, it doesn’t make sense to lug around heavy jackets and hiking equipment for the entire trip. You can buy just about anything you need when you arrive at your hiking destination. Sometimes it’s not practical to buy something while you’re traveling and you’re better off taking it with you or finding an alternative. Special occasion clothing can be tricky. At the end of my round the world trip, I had a wedding to attend in Atlanta before going back home to Germany. I knew I could find something cheap to wear while I was there, so I didn’t travel with nice clothes I wouldn’t wear for five months. But if you’re going to a wedding in certain parts of Asia where the clothing sizes might be too small, you might want to pack a nice outfit. Pack something versatile that can be dressed up for the wedding but also dressed down for other occasions while you’re traveling. Caroline wore her Encircled Chrysalis Cardi as a dress to a wedding, but it can be worn in lots of other styles. Tieks ballet flats are a good choice for shoes since they’re comfortable enough to wear while sightseeing, but they can also be paired with a dress. In some parts of the world, tampons are hard or impossible to find. For a short trip, bring what you need to get you through. But for longer trips, consider switching to something like the Diva Cup. You won’t have to worry about buying tampons, and they’re better for the environment. Read more about managing your period on the road. Some medication is hard to find in other parts of the world. Do some research to find out, but if you don’t feel you can fill your prescriptions on the road, bring as much as is practical. You can have someone back home mail you more later. If that’s not an option, you might have to plan a short trip home or to another country where you can get your medication. What items have you bought while traveling? What things have you had trouble finding on the road? I haven’t yet traveled to more outlandish and exotic places, so I have always been able to find and buy whatever I needed on the road. I do this all the time. The last time we went to the US, we only packed 100ml bottles of everything because we were spending the night in a hotel before leaving, and then when we landed our first stop was to a drug store. Works out perfectly. Although, when I was in Austria, it was a little funny trying to look up how to ask for “deep heat” when my legs were getting sore from all the walking! I had a hard time finding ClearCare / AO Sept – a hard contact lens hydrogen peroxide based cleaner in most of SE Asia. I’ve only seen it in Singapore, Kuala Lumpur, Hong Kong and Taiwan. I didn’t want to carry a bunch of 100ml bottles and sorely regretted it when I was running low on Vietnam and went to 20 optical stores with no luck. Planned for a 1 day layover in HK just so I could stock up. Contact lens solution seems to be a tough one from what I’m gathering. I’ve been with people who’ve been able to buy it in crazy locations, but since I’m not a glasses/contact wearer, I wouldn’t know the difference in solutions, etc. Maybe we should do a big research post on contact lens solution tips for travel! Contact lens solution is my one worry about traveling with only travel-sized toiletries. I would LOVE it if you did a post on that! I also wear ClearCare but can’t imagine I’ll be able to find that in Asia as Michelle said, but would be okay with switching to a more typical brand. I guess if all else fails, I could just wear my glasses… but I hate doing that if it’s sunny. Hi Ashley! Caroline actually just wrote a post about traveling with contact solution. I’ve spent a couple months at a time traveling in SE Asia, and I was always able to find contact solution at optical shops. Anywhere that sells glasses always had contact solution, though it might not be your exact brand. I typically travel with as many travel-sized bottles as I can fit in with my other liquids, and then I buy more along the way. I think you’ll be fine unless you’re going somewhere incredibly remote. In Asia – and I’m talking HK, Japan, Singapore, now Australia, and probably other countries too – there’s a great store called Uniqlo. They sell the most absolutely feather-light down jackets and coats, as well as technical underclothes for both hot and cold climates. Their prices have to be seen to be believed – my last winter coat for everyday wear was a plain black zippy, packs down to the size of a large pair of socks, and was only AUD $100. Cheaper in Asia of course (Sydney has one of the highest cost-of-living of almost anywhere in the world, save for Iceland). I use it all the time in Aussie winters, so you know it’s lighweight enough for 15-20 degrees centigrade. And I’ve worn it in the snow too, since it’s a great windbreaker for chillier weather (I think it got down to about 0 degrees there). Plus, stuffed into its carry bag, it’s so wonderfully soft I can happily use it as a plane/bus pillow! Completely perfect. Uniqlo sells all sorts of clothes, mostly mix and match basics, as well as underwear and pyjamas, for incredible prices, and all in a range of colours. Remember the name for your next Asia trip!